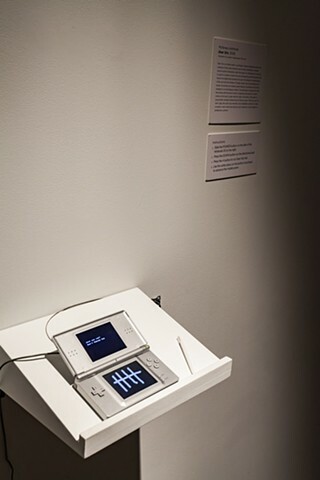 Dear Sirs is a mobile poem—a workplace related resignation poem and marking of time using mesostics and numeric references to embed secret locative information within the poem on a Nintendo DS. Dear Sirs is a part of a series of works that are all interactive game like poems that exploit the relationship between the user, the hardware, the physicality of the user and the interface. Through visuals, text and interaction the poems circumvent and explore poetic/textual conventions and human empathy in a technological context. The participant is required to mark time along with the poet in order to experience the poem. For each stroke on the touch screen with the stylus—one letter of the poem is sequentially revealed. Referencing the famous poem “What you say” by John Cage, this work uses mesostics and embedded numbers to reveal a location—both virtual and physical, and a rejection of participation in problematic systems.